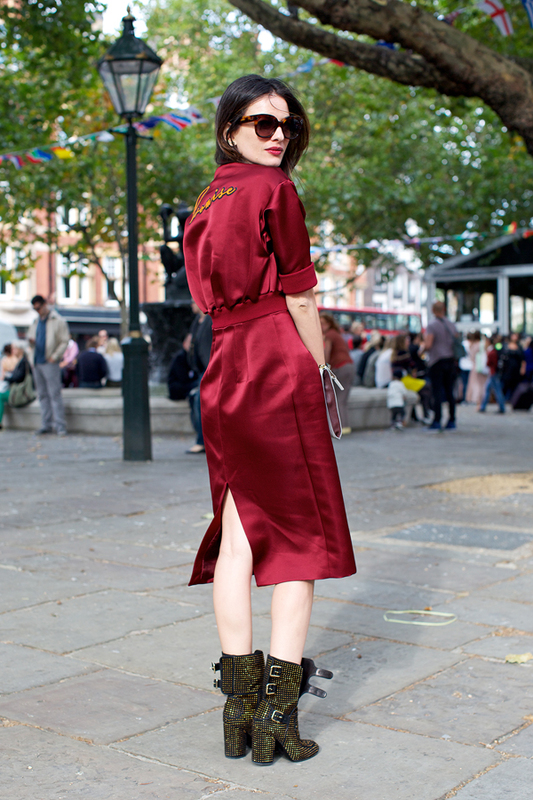 London Fashion Week street style is interesting mixing simple casual clothes with designer and vintage pieces. The best outfits from bloggers, writers, fashion icons, celebrities and models are here. Fashion editor Anna Dello Russo was spotted wearing a black blue outfit embellished with jewels and round sunglasses with crystal-encrusted frame. Hege Badendyck wore Acne dress and sunglasses and Alexander Wang shoes. Another interesting outfit is from fashion correspondent Nausheen Shah whoe wore George J Harding shirt, shorts, and jacket accessorized with Celine bag and Ray Ban sunglasses. Blogger Peony Lim was spotted during London Fashion Week wearing a crisp white Hermes shirt which she paired with blue jeans and eye-catchy Manolo Blahnik shoes with red spikes. The accesories included red clutch, white hat, and a wide metal studded belt. Christine Centenera wore a Josh Goot top with a Lanvin skirt and accessorized with Celine bracelets. Buyer Carol Song paired a lace sleeve black dress and a sporty jacket from Opening Ceremony which she accessorize with round sunglasses and a Factory clutch. Fashion icon Olivia Palermo paired a Reiss top with skirt from Matthew Williamson and accessorized with golden bracelets, black clutch and burgundy pumps with metallic toe caps. Rosalind Jana opted for a vintage look with a floral printed blue dress, taupe hat, and a bright blue bag. Clara Paget, model and actress went for purple Christopher Kane shirt in floral print which she paired with black slim trousers from Gucci. Dita Von Deese wore a printed floral dress which she paired with brown shoes carrying a burgundy bag and a matching umbrella.